March 2009 View a presentation describing the City of Duluth's Inflow & Infiltration reduction project. For more information about the City of Duluth’s I&I program please call 218-730-4130. Read about steps taken by the Western Lake Superior Sanitary District (WLSSD) to control the problem (2.5 MB pdf). Visit the WLSSD website for their latest news releases. This term describes one of the main causes of sewer overflows around Lake Superior, Inflow and Infiltration. Inflow refers to clear water from rain and snowmelt that improperly drains into the sanitary sewer system. Infiltration refers to ground water that leaks into the sanitary sewer system through cracked or faulty sewer pipes. Both sources of water are basically clean. Why is I & I a problem? Most communities around Lake Superior have two different sewer systems. 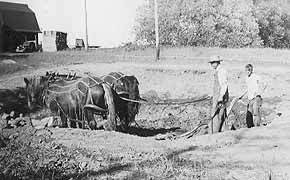 Sanitary sewers were designed to carry wastewater (containing sewage) from homes and businesses directly to a treatment facility where it can be cleaned before being released back into natural bodies of water. 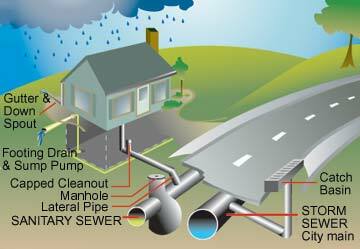 Storm sewers were designed to handle rain and snow melt that runs off the land and roads. This sewer drains directly to area streams, rivers and Lake Superior and is not cleaned. During heavy rainstorms, I & I may cause the sanitary sewers to quickly fill with clear rain water that should have been directed to the storm sewer. When too much of this clear water mixes with untreated sewage, the volume flowing through the sewer pipes may exceed the capacity of the sanitary sewer system pipes. The result is that water cannot reach the treatment plant to be cleaned because the system becomes pressurized and essentially “blows” - with diluted sewage backing up into basements or overflowing onto streets. This dirty water then flows into area streams, rivers and lakes. These overflows can lead to exposure to untreated wastewater. What causes I & I? Old or cracked pipes may allow clear water to seep into the system through infiltration. Private service lines from homes and businesses may leak because of age, poor design or poor maintenance. 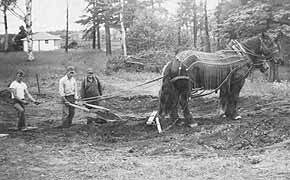 Fifty-five percent of Duluth’s sewer system is over 50 years old. Another large source of water is inflow from roofs, foundation drains and improperly drained sump pumps in area homes. Most homes built before 1970 were designed with roof drains or foundation footing drains that unfortunately direct rainwater into the sanitary sewer system. How did my basement grow? If you own an old house, this might be how! 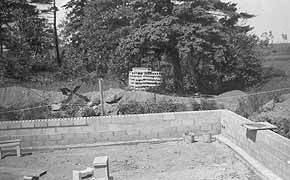 Notice the FOOTING drain being installed in the lower-left photo (taken in the 1940's). These footing drains were connected to the sanitary sewer system, and are now one of the causes of overflow problems in Duluth. While old footing drains are good at keeping water away from the foundation of the house and help to keep basements dry, they are one of the largest contributors of clear water to the sanitary sewer system. 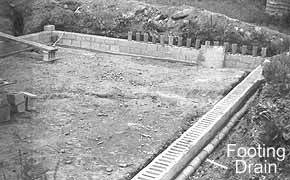 Footing drains should be redirected to empty into a sump pit. The water can then be pumped out by a sump pump into the yard where it can be dispersed into the natural soil-groundwater and then flow harmlessly away in the storm sewer system. What are the solutions to I & I ? Cities are exploring many ways to reduce I & I around Lake Superior. The City of Duluth’s I&I program seeks to remove clear water through the installation of sump pumps and the disconnection of footing drains from the sanitary sewer system. The program designates an area of the city each year for mandatory inspection and disconnection. In some areas, grant funding is available to help complete the necessary sump pump installations. The City of Duluth also has a maintenance program to ensure that the sewer pipes are in good condition. City programs are important, but actions by individual homeowners can also make a big difference. Keep your sewer in good connection. Broken sewer pipes (laterals) between the private home and the city’s main line are usually the responsibility of the homeowner. Keep it clean and do not plant bushes or trees on top of it. Make appropriate repairs and replace if necessary. Make sure your home’s footing drains are not connected to the sanitary sewer system. Install a sump pump and discharge the water into your yard, away from the house. Ensure that your home does not have old downspouts that drain directly into the sanitary sewer system. Install gutters and downspouts that direct rainwater away from your home’s foundation. Rain Barrels and Rain Gardens are inexpensive and attractive ways to help landscape your yard so that water drains away from the house.